From the second I landed in Hue, I loved it. I’ll attempt to put into words why but you know sometimes you just go somewhere and get a good feel about it? Well it’s one of those. Yes the streets are crowded like Hoi An but there’s still a feeling of space. On the short walk from the bus to the hotel I caught glimpses of art shops, with local painters with their own spaces displaying huge brightly coloured oil prints. Like so many asian cities it really comes alive at night, even more so at this time of year as it’s Half Moon celebrations (festivals follow the Chinese lunar calendar). Local kids dance around the streets in yellow and red dragon outfits, they run into shops and restaurants, play tambourines and fill places up with laughter. They do bridges so much better out here, they’re lit beautifully at night often in different colours making them spectacular. A group of us headed to the night market with the aim to try the street foods. We pulled up a few stools at a popular pop-up restaurant and ate grilled frog (I blocked thoughts of my pet albino frogs back home out of my head) and yes it does taste like chicken. The beef wrapped in Lolot leaves didn’t taste a great deal like beef but it was succulent, seasoned with lemon grass and delicious. During the day there are so many trips and if I’d been staying longer I could have filled my days easily with the DMZ tour (demilitarised zone), the Citadel, the beach and lots more. We chose to do a dragon boat trip down the Perfume River, which stopped off at lots of historical sites, most of which were really beautiful. The Khai Dinh Tomb is a must see. Once you make it to the top of the steps you enter a building with some of the most stunning intricate art coating the walls. Ceramic patterns and designs adorn every inch of the interior. I watched incense sticks being made by a local lady and sugar cane juice strained to make juice in one of the stops. The perfume river is clean with lush green landscape either side. I’m learning fast that the places that don’t seem to inspire others turn out to be my favourite places and vice versa. I’d have skipped Hue if I’d listened to fellow travellers but thank God I didn’t! ← Hoi An – Snorkelling, ruins and definitely no clothes shopping! Shame about Hoi An. I’ve been twice. the first time the kids were younger so we stayed midway between the beach and the town in a budget hotel. It was quiet yet near everything. Loved it. The second time both kids had proper exams so we wanted to be nearer the town and somewhere where they could relax and revise (!) so stayed in a swanky hotel on the river in the town. Loved that as well for different reasons. Whilst we saw the cheap drinks places we didn’t go in them. We ate in Madme Vy (might be (Ly) places and the food and the vibe were fantastic. Shame about the mugging threat. I’m a middle aged bloke with lots of money and my kids are young and ‘vulnerable’ and we all walked around at one point or other on a our own (day and night) and never felt threatened at all. Interested to hear you really liked Hue as we loved it there as well so I dont know why I didn’t mention it to you. I know what you mean about the open spaces and the buzz about it. It sounds as though we did the same river trip as well. And now you are in Hanoi. An iconic city for someone of my generation. Ho Chi Minh’s house and everything. I look forward to your thoughts on that. Hi Steve, I’m starting to think I was a little unfair on Hoi An but sadly I didn’t see it at it’s best. i’m certain my sleep deprived arrival marred my opinion and my choice of accommodation also impacted my few. Stupidly I didn’t explore at night and Asian cities are nearly always at their best when it gets dark. Oh well, I’ll just have to head back there some time! 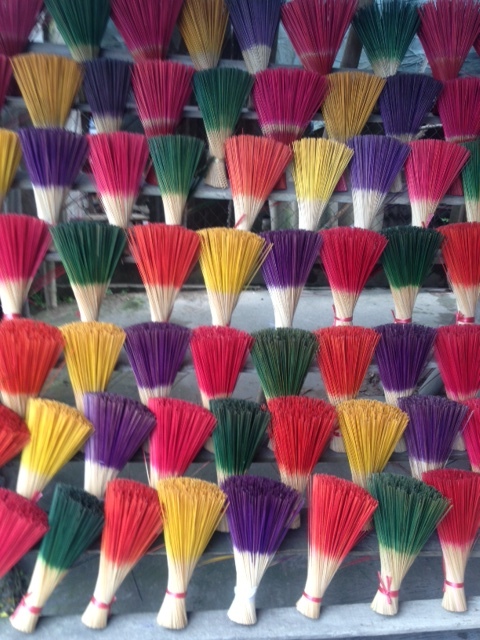 I loved Hanoi… as soon as i get a chance to blog about it I will!